The natural thermal mineral pools in Welcome Bay are a great place to visit all year round. The hot pools are emptied and cleaned every day, and the pool grounds are always kept clean and tidy. The main pool and the toddler pool are tepid and comfortable, with a depth of 70cm on one side to 1.2m at the deepest end. The small spa pool is the hottest, at around 39º Celsius (102º Fahrenheit), but temperatures vary and are weather dependant. There are plenty of picnic areas and sheltered spots with tables around the pool area. Drinks, snacks and ice-creams can be purchased from the kiosk and the BBQ can be hired by prior arrangement. When hiring the BBQ or bringing food into the pools we ask that everyone pays the admission fee, swimmers and non-swimmers. Please ensure that there is no glass or alcohol in with your picnic items. 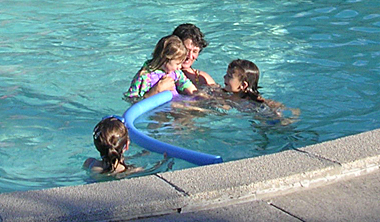 The Welcome Bay Hot Pools are an affordable and popular choice of venue to host a children’s birthday party. There is plenty of parking available, and the kids can swim and play while adults can relax and enjoy the natural surroundings. Kids will have a great time in the pools, with a dedicated swimming space provided for toddlers (Parental supervision of young children is necessary at all times). Adults can relax in the spa, while the teenagers play in the pool. You can use the BBQ and bring a picnic, so the house will be tidy on your return. Closed on Monday and Tuesday, except for public holidays and during the school holidays when we are open every day 10 am - 9 pm.